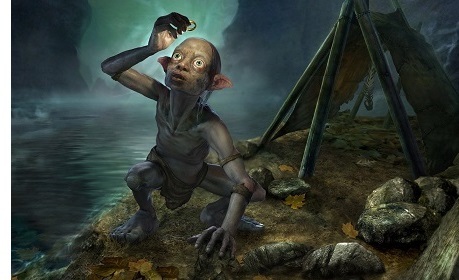 Sméagol - After being hidden for 2500 years, the One Ring suddenly reappeared. "'The most inquisitive and curious-minded of that family was called Sméagol. He was interested in roots and beginnings; he dived into deep pools; he burrowed under trees and growing plants; he tunneled into green mounds; and he ceased to look up at the hill-tops, or the leaves on trees, or the flowers opening in the air: his head and his eyes were downward. He had a friend called Déagol, of similar sort, sharper-eyed but not so quick and strong. On a time they took a boat and went down to the Gladden Fields, where there were great beds of iris and flowering reeds. There Sméagol got out and went nosing about the banks but Déagol sat in the boat and fished. Suddenly a great fish took his hook, and before he knew where he was, he was dragged out and down into the water, down to the bottom. Then he let go of his line, for he thought he saw something shining in the river-bed; and holding his breath he grabbed at it. Then up he came spluttering, with weeds in his hair and a handful of mud; and he swam to the bank. And behold! when he washed the mud away, there in his hand lay a beautiful golden ring; and it shone and glittered in the sun, so that his heart was glad. But Sméagol had been watching him from behind a tree, and as Déagol gloated over the ring, Sméagol came softly up from behind. "Give us that, Déagol, my love," said Sméagol, over his friend's shoulder. "Because it's my birthday, my love, and I wants it." said Sméagol. "I don't care," said Déagol. "I have given you a present already, more than I could afford. I found this, and I'm going to keep it."